Beauty Costs > How Much Does Silk Fabric Cost? How Much Does Silk Fabric Cost? Silk is known to be one of the finest yarns available and can be used to create an elegant-looking fabric and rustic look. 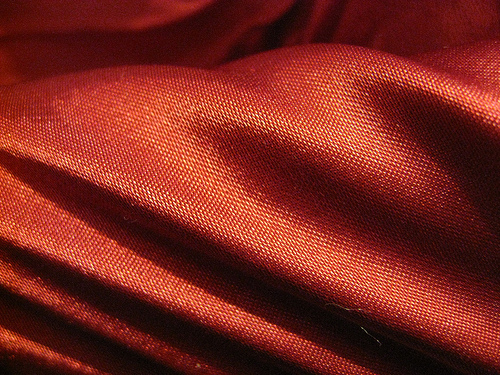 Silk fabric comes in a variety of weights. Lighter silk will usually be used for a dress, while a heavier silk may be used to create a suit. Silk can also be crisp or softened. A crisp silk will be used for a top or as trim, while softened silk will be used to create pants. The cost of silk fabric will depend on the type, quality, its rarity, the amount, the colors and where it’s purchased from. On average, the cost of silk is going to vary anywhere from $5 to as much as $65 per yard. Most silk fabric, from what we saw, will be in the $5 to $15 per yard range. FashionFabricsClub.com, an online retailer that sells different kinds of silk in various colors, sells silk for $7 to $60 per yard. Walmart often carries a handful of options at its local stores. Here, the prices range anywhere from $10 to $45 per yard, depending on the pattern and brand. Silk, like any other fabric, can come in many colors, including beige, black, blue, brown, gray, green, ivory, orange and pink. The fabric can come in widths ranging from 36 to 72 inches, with the high majority being in the 44 to 57-inch range. While most silk fabric will be a solid color pattern, it can also be found with stripes, plaid, floral designs or an abstract look. Silk fabric is suited for apparel, blouses, bridal gowns, drapes, dresses, jackets, overlays, slacks and suits. Since silk can be hard to find locally, you may have to buy it online. Before committing to your purchase, consider ordering a small sample, something many online retailers allow you to do. This way, you will know if the fabric will work with your project.